After reeling from the enormity of the terrorist attacks on the World Trade Center buildings in New York on September 11, most Americans who were finally regaining their composure were sent reeling again from the postal anthrax attacks. While nearly everyone insists they are continuing to live their lives without altering their daily schedules, a continual low-grade worry over the well-being of ourselves, families, and friends has imposed itself on many of our psyches. The idea of an untreatable, killer epidemic sweeping across the nation is certainly frightening. However, I will attempt to show you that our treatment options might not be as bleak or limited as they might seem to be. Let's first consider some of the known information about anthrax and smallpox, which are perhaps two of the most significant bioterrorism agents. Anthrax is a bacterial disease that occurs primarily in one of four forms: cutaneous (skin), inhalation (lung), gastrointestinal, and oropharyngeal (mouth and throat). It is readily transmissible in a spore form that readily germinates into growing bacteria when a receptive host environment is encountered. So far the only two forms of this disease resulting from the postal attacks have been cutaneous and inhalation. The cutaneous form of anthrax can occur on any exposed skin surface, progressing eventually to a blackened, ulcerated lesion. The blackened appearance of this lesion accounts for the name "anthrax," which comes from the Greek word for coal. Untreated, it can result in death about 25% of the time. When treated with antibiotics death is rare. Except in the context of a widespread bioterrorist attack, inhalation anthrax is extremely difficult to diagnose. The incubation period can range from 1 to 6 days, initially presenting with flu-like symptoms. The next phase of the disease can proceed very rapidly to death after lung symptoms present. Difficulty breathing, coughing up blood, chest pain, and profuse sweating are common symptoms at this point. The infection then proceeds to a blood poisoning that will further proceed rapidly to death even if antibiotic therapy is finally initiated. Although anthrax appears to be treatable by antibiotics in the early stages of the disease, the advanced inhalation form of this disease will typically not respond to such therapy, and death will result. An anthrax vaccine has been developed, but it is really only available to the military at this time. Furthermore, we are told that purified, antibiotic-resistant forms of anthrax for military use exist. Fortunately, such forms of anthrax do not yet appear to have been disseminated in any fashion. Inhalation anthrax is especially deadly because of its rapid progression after the initial lung symptoms appear. This is largely due to the fact that anthrax is an infection that not only grows, but also produces potent toxins (Bhatnagar and Batra, 2001; Brossier and Mock, 2001; Mock and Fouet, 2001). In fact, the coughing up of blood is a reliable indicator that the toxins are being produced in critical amounts deep in the lungs. The antibiotic therapy for the anthrax organism has no effect on bacterial toxins that have already been produced. Antitoxin therapy, a treatment intended to neutralize a toxin, was tried in the past, but this therapy is not currently available. A good recent review of anthrax as a biological weapon was compiled by Inglesby et al. (1999). Interestingly, the 21st edition of the Cecil Textbook of Medicine, copyright 2000, considers penicillin as the drug of choice for anthrax. Cipro (ciprofloxacin), which is currently being highly touted in the news, is listed along with a number of other antibiotics as being indicated primarily for the treatment of anthrax victims who are allergic to penicillin. However, ciprofloxacin and doxycycline are the antibiotics commonly recommended when there is a known or suspected exposure. More recently, doxycycline is being promoted as the oral prevention antibiotic of choice, in the hopes that any antibiotic-resistant microbes that eventually result might then be susceptible to ciprofloxacin. Smallpox, a deadly viral disease, is also being mentioned as a leading candidate for another bioterrorist attack. The established therapy available for smallpox is to vaccinate before infection or fairly early after infection. Immune globulin therapy is also available to hopefully lessen the degree of infection and resulting illness. If these measures fail, supportive therapy is the only remaining traditional option. Either the patient's immune system eventually wins, or the patient dies. Furthermore, the patients who are fortunate enough to survive face significant skin scarring after the characteristic skin lesions finally resolve. Smallpox is considered a significant threat as it has a case-fatality rate of 30% or more among unvaccinated persons. Furthermore, since routine smallpox vaccination ceased in the United States more than 25 years ago, the degree of continuing protection from very old vaccinations against contracting smallpox now is less than clear. Some experts feel the protection is largely gone (Henderson et al., 1999). The ability of smallpox to be a potent biological weapon was already demonstrated long ago. During the French and Indian Wars from 1754 to 1767 British forces in North America were able to initiate smallpox epidemics among the American Indians (Stearn and Stearn, 1945). Blankets used by smallpox victims eventually reached the Indians, and death rates exceeding 50% were seen after some of the tribes were successfully infected. The smallpox patient is most infectious to others from the onset of the characteristic rash through the next 7 to 10 days (Mack, 1972; Mack et al., 1972). This rash is preceded by high fever and a symptom complex that could certainly be confused with the flu. Especially progressive smallpox infections can result in widespread hemorrhage and death within only 5 to 6 days of the onset of the rash. Smallpox vaccinations are not without risk (Lane et al., 1969). Encephalitis (brain inflammation), severe skin rashes, and even a progressive, sometimes fatal, infection directly resulting from the inoculation can all occur. A non-toxic alternative to this vaccination would be highly desirable. The current rareness of both anthrax and smallpox is highlighted by the fact that the 2001 edition of Conn's Current Therapy does not even mention either of these diseases. Few physicians have any first-hand clinical experience in the treatment of these diseases. The medical literature has clear documentation that high enough doses of injectable vitamin C are almost always effective in curing any of a number of viral infections still considered today to be incurable. Klenner (1949) completely cured 60 out of 60 cases of infantile polio in North Carolina in the middle of a polio epidemic. Several infants already had neurological involvement, but nevertheless recovered completely. Klenner (1951) was also able to bring about a complete recovery by administering enough vitamin C to one five year-old polio victim who had already been paralyzed in both legs for over four days. Klenner (1949, 1953, 1971, and 1974) also reported the repeated ability to rapidly cure viral diseases such as encephalitis (often presenting in the comatose state), herpes infections, acute hepatitis, measles, and mumps. Klenner found that his only inadequate responses to treatment were overcome by increasing the vitamin C dose and/or going from an oral to an injectable form of vitamin C. Cathcart (1981) also reported an incredible success in the treatment of many viral diseases for which no specific anti-viral agents exist today. Of particular interest, he reported that he never had a case of viral hepatitis fail to respond to intravenous vitamin C. Furthermore, he never observed a single case of acute hepatitis treated appropriately with vitamin C to persist long enough to evolve to the status of chronic hepatitis. Finally, although no specific studies looking at the effects of vitamin C on smallpox could be found, Kligler and Bernkopf (1937) were able to determine that relatively small doses of vitamin C could easily kill the vaccinia virus, which is the virus in the vaccine that induces immunity to smallpox. Vitamin C has also been documented to rapidly resolve a number of non-viral infectious diseases that do not readily resolve in the absence of vitamin C therapy. Diptheria (Klenner, 1949 and 1971), whooping cough (Otani, 1936 and 1939; Ormerod et al., 1937), and tetanus (Klenner, 1954) all have responded very well to vitamin C. Of great interest as well is that all three of these infections are associated with very significant microbe-generated toxins, much like anthrax. Jungeblut and Zwemer (1935) found that vitamin C both inactivated diphtheria toxin in the test tube and protected guinea pigs against the fatal outcome of being injected with otherwise fatal doses of diphtheria toxin. Dey (1966) showed that enough injected vitamin C would completely protect rats from otherwise fatal doses of tetanus toxin. Klenner never encountered a virus he could not cure, although he used doses of vitamin C that are considered outrageously high today, even though such doses are nevertheless decidedly non-toxic. His initial dosing of vitamin C would go as high as 700 mg/kg body weight, which could exceed 70 grams for a large man. Furthermore, he would repeat this high dosing in only a few hours if no drop in fever or clear clinical improvement resulted. He never reported any toxicity from vitamin C dosed in this fashion. However, he repeatedly reported that initially unresponsive patients did finally respond when enough vitamin C was administered frequently enough. From the very current scientific literature we know that 60 grams of vitamin C can be repeatedly infused without toxicity over only an 80-minute period. Furthermore, 50-gram intravenous doses of vitamin C can be given daily for 8 weeks without any side effects other than improved health (Casciari et al., 2001). My own clinical experiences with intravenous vitamin C infusions allow me to completely believe all of the data that Klenner and others have accumulated. Many feel vitamin C did not deliver as promised when Linus Pauling's recommendations of a few grams of vitamin C a day did not end up curing or completely preventing the common cold. To be sure, it did make those infected feel better, and it shortened the durations of their symptoms. It did also lessen the likelihood of getting a cold. Once entrenched in the body, however, the common cold results in a very high titer of virus particles. A few grams of vitamin C will help the immune system cope, but it is not remotely enough to promptly eradicate the virus load present. However, several hundred grams of vitamin C intravenously daily for 2 to 3 days can be expected to knock out the common cold in most people. The next time you have already been sick with a cold for a few weeks, you will appreciate what a remarkable clinical response this is. After determining your best daily dose of vitamin C by following the bowel tolerance method outlined by Cathcart (1981) and after taking that daily dose regularly, the likelihood of contracting any infectious disease, anthrax and smallpox included, is remote. For many people, this will translate to a total daily dose of vitamin C of 8 to 15 grams taken in divided doses, although some people will require more. The recommended form of vitamin C would be sodium ascorbate, although ascorbic acid would be perfectly acceptable. I do not recommend high doses of calcium ascorbate. If you are exposed to a very high dose of infectious organisms, the maintenance doses of vitamin C noted above can be overwhelmed and clinical infection can still result. The simple answer then is to start vitamin C infusions at up to 700 mg/kg at a time as often as is necessary to obtain a positive clinical response. Lesser amounts and less frequent dosing can be used if the clinical picture is not severe. Obviously, the administration would have to be very vigorous in an inhalation anthrax patient who has already developed lung symptoms and death may be only hours to a day or two away. Certainly, in the case of anthrax, there is no reason not to take all prescribed antibiotics as well, but the antibiotics will have little effect if large amounts of anthrax toxin have already been produced. The vitamin C would be essential at that point. In viral diseases where bleeding complications occur, the bleeding will often occur at those sites in the body where vitamin C levels are lowest, or even nonexistent. It is absolutely characteristic for such "focal" sites of scurvy to hemorrhage, and nothing short of very large doses of vitamin C given very quickly can be expected to save the patient at that point. 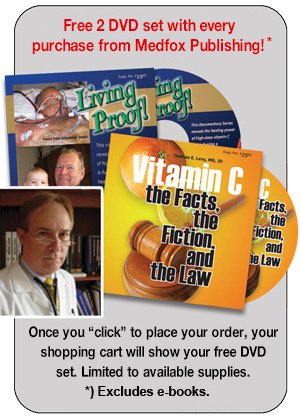 Regardless of any skepticism that the reader may have toward such high-dose vitamin C therapy, it is absolutely unthinkable not to try it or add it to whatever protocol is being administered to the patient. At the very least, all acute infectious diseases rapidly metabolize vitamin C, and all acutely ill patients are consequently deficient in vitamin C. The administration of vitamin C should always be undertaken when acute vitamin C deficiency is a certainty, even if one does not believe that enough vitamin C can be a definitive therapy by itself. Hydration is also extremely important, both in health and disease. Furthermore, vigorous hydration (2 to 4 quarts of water daily) will augment the effectiveness of the vitamin C therapy. Just about the only time high doses of vitamin C can cause problems is if the patient is not kept very well hydrated. Remember that patients with high fever lose body water rapidly. Most other medicines have more side effects in the face of dehydration as well. There are many other supplements and nutrients that can augment the anti-microbial effects and immune-bolstering effects of vitamin C, which is beyond the scope of this issue of the newsletter. Just don't neglect the most important one: vitamin C.
Bhatnagar, R. and S. Batra. (2001) Anthrax toxin. Critical Reviews in Microbiology 27(3):167-200. Brossier, F. and M. Mock. (2001) Toxins of bacillus anthracis. Toxicon: Official Journal of the International Society on Toxinology 39(11):1747-1755. Henderson, D., T. Inglesby, J. Bartlett, M. Ascher, E. Eitzen, P. Jahrling, J. Hauer, M. Layton, J. McDade, M. Osterholm, T. O'Toole, G. Parker, T. Perl, P. Russell, and K. Tonat. (1999) Smallpox as a biological weapon. Medical and public health management. The Journal of the American Medical Association 281(22):2127-2137. Inglesby, T., D. Henderson, J. Bartlett, M. Ascher, E. Eitzen, A. Friedlander, J. Hauer, J. McDade, M. Osterholm, T. O'Toole, G. Parker, T. Perl, P. Russell, and K. Tonat. (1999) Anthrax as a biological weapon. Medical and public health management. The Journal of the American Medical Association 281(18):1735-1745. Jungeblut, C. and R. Zwemer. (1935) Inactivation of diphtheria toxin in vivo and in vitro by crystalline vitamin C (ascorbic acid). Proceedings of the Society for Experimental Biology and Medicine 32:1229-1234. Klenner, F. (1949) The treatment of poliomyelitis and other virus diseases with vitamin C. Southern Medicine & Surgery 111(7):209-214. Klenner, F. (1951) Massive doses of vitamin C and the virus diseases. Southern Medicine & Surgery 103(4):101-107. Klenner, F. (1954) Recent discoveries in the treatment of lockjaw with vitamin C and Tolserol. Tri-State Medical Journal pp. 7-11. Kligler, I. and H. Bernkopf. (1937) Inactivation ofvaccinia virus by ascorbic acid and glutathione. Nature 139:965-966. Lane, J., F. Ruben, J. Neff, and J. Millar. (1969) Complications of smallpox vaccination, 1968. National surveillance in the United States. The New England Journal of Medicine 281(22):1201-1208. Mack, T. (1972) Smallpox in Europe, 1950-1971. The Journal of Infectious Diseases 125(2):161-169. Mack, T., D. Thomas, and M. Muzaffar Khan. (1972) Epidemiology of smallpox in West Pakistan. II. Determinants of intravillage spread other than acquired immunity. American Journal of Epidemiology 95(2):169-177. Mock, M. and A Fouet. (2001) Anthrax. Annual Review of Microbiology 55:647-671. Stearn, E. and A. Stearn. (1945) The Effect of Smallpox on the Destiny of the Amerindian. Boston, MS: Bruce Humphries.